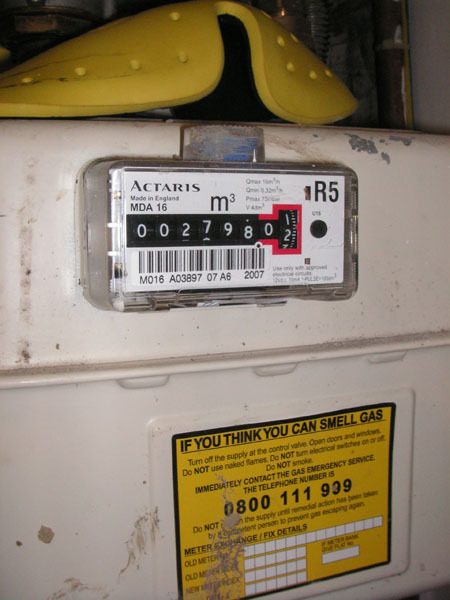 If your meter measures in cubic feet (ft3) the display panel will show four digits before the decimal point. 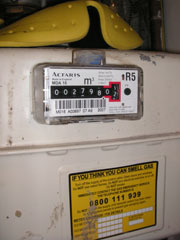 If your meter measures in cubic metres (m3) the display panel will show five digits before the decimal point. For example, the reading for the digital meter shown below should be recorded as 6653. If you have a dial meter, please remember the following points when you take a reading: Adjacent dials rotate in opposite directions Ignore dials marked ‘100 per rev’ and the large dial Ignore red dials Read the other dials from left to right; write down the number that the hand has passed If the pointer falls between two figures, write down the lower figure. 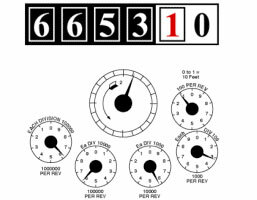 If the pointer falls between 9 and 0, write down 9 For example, the reading for the dial meter shown above should be recorded as 6653.